Learn The Power Of Delegation! Diane Morrison’s 30 years of experience teaching more than 17,000 leaders has shown that delegation is the most overlooked and powerful dimension of productive leadership and career success. Learn the effective 2-Way Delegation skills that will enable you to get ahead in your career. How you deliver the message is as important as the message itself. 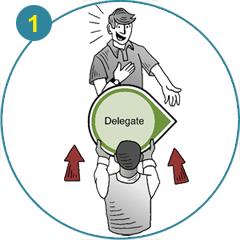 Learn to delegate and take delegation so that tasks are performed effectively. Learn how delegation will increase your value as an employee and take your career to the next level. 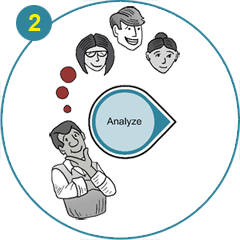 Find out why your team leader communicates the way they do and what they really mean. Sometimes what seems like micromanagement is actually an attempt to provide support. Is an opportunity to gain experience and develop new skills. Shows that you are a trustworthy, valuable member of the team. Is crucial to building productive team chemistry – both as a team member AND a future team leader. Demonstrate to your superiors that you’re ready to take on more challenges and advance in your career. 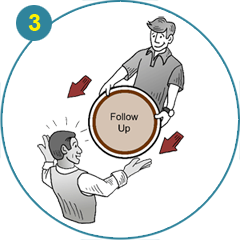 Learn to ask for and receive constructive feedback. Learn to navigate micromanagement minefields. 2-Way Delegation is much more than your average how-to textbook. The app combines interactive exercises and guided practices with traditional instruction to create a unique skill development experience. 2-Way Delegation also encourages you to share your results and experience with a vibrant leadership community, giving you the benefit of the community’s experiences and insight in return. Experience, practice, share and learn. The return you’ll receive on $19.99 makes 2-Way Delegation one of the wisest investments you’ll ever make. Get the app now!